Jim Jarmusch's Paterson finds the beauty of art in ordinary places. At first glance, Paterson (Adam Driver) is an ordinary guy to an extent that's almost a cliché, like the platonic form of Ordinary Guy. He gets up every morning, kisses his wife, Laura (Golshifteh Farahani), and sits down to a breakfast of Cheerios eaten out of a juice glass. He goes to work as a bus driver for the New Jersey Transit Authority, carrying a metal lunchpail. At the end of his day, he comes home, takes the dog for a walk and stops in for a beer at his neighborhood bar. And he writes poetry, kept in a secret notebook that he shares with almost nobody. For writer and director Jim Jarmusch, there's no incongruity in the addition of that last fact—and that's the key to the low-key gloriousness of Paterson. The movie takes its name both from its protagonist and from his home of Paterson, N.J., which was also the home of celebrated modern American poet William Carlos Williams, making this a perspective on art that feels almost revolutionary in this moment. Creativity, Jarmusch argues, isn't something that's just for other people. Inspiration is everywhere, and those who can be inspired are, too. Jarmusch structures Paterson in a manner that seems designed to emphasize the sameness of Paterson's days, opening with a caption announcing the day of the week and running through those aforementioned familiar patterns in his routine. Yet that same structure also serves to draw attention to what's unique about each of those days: a particular conversation Paterson overhears between his passengers; an encounter with a would-be rapper during the evening dog walk; a dramatic confrontation at the bar. Paterson is full of bits and pieces of detail that don't "pay off" in a conventional dramatic sense, but in a way that's part of the point. What makes Paterson an artist is that he pays attention; every detail could become a future poem. Driver conveys that watchfulness in a performance that's quiet and introspective, but far from deadpan. When he smiles, or breaks into laughter at the overly dramatic profession of love from another man at the bar, there's an utter genuineness to it; he may be a man of few spoken words, but it's easy to see the emotion beneath the surface. 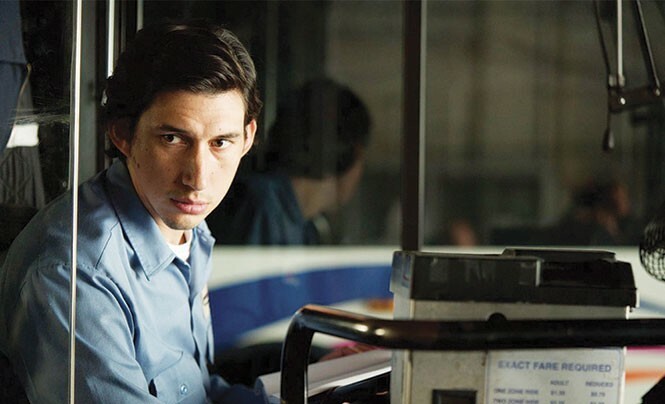 There's a level on which his character could come off as a bit of an eccentric, what with his insistence on waking up without an alarm, or refusing to own a cell phone, but Paterson turns those qualities—and the absence of distraction that makes him the kind of person who actually acknowledges the homeless man he encounters on his walk home—into part of what makes him an artist. Another part is his relationship with Laura, and it's hard to overstate the level on which Paterson is an absolutely enchanting love story. Laura is herself a creative spirit—bouncing from painting a shower curtain to making cupcakes for the local farmers market to learning to play the guitar—but Jarmusch conveys his lack of judgment through Paterson's interactions with her. He's infinitely supportive of his wife's sparks of inspiration, to the point where you can only get a sense of his real feelings about her Brussels sprouts and cheddar cheese pie by the way he drains a full glass of water after every bite. From the photos of Laura that Paterson carries in his lunchbox to the swooning love poems he dedicates to her (in the poetry written by Ron Padgett), it's obvious how much she inspires him, and Jarmusch presents a portrait of how art might only be able to blossom in the presence of people who support and encourage it. Jarmusch's languorous narratives and droll sense of humor have always left some viewers unmoved, and it's easy to anticipate people describing Paterson as the kind of movie where "nothing happens." But even leaving aside some of the surprisingly big laughs here—including a killer punch line involving Paterson's perpetually askew mailbox—this is a story about the work of artistic creation that gives it as much respect as the blue-collar work of driving a bus. We watch Paterson circling around to work on his poems multiple times, the narration emphasizing his careful choice of each word. There is no limit to where and how art can be created, Paterson reminds us, in a beautiful character study that turns everyday life into its own kind of poetry.